As a California credentialed Science teacher, you’ll teach students that science can solve problems. But what if the problem is this: you must pass your CSET Science exam before you can teach! So if this describes you. . .
. . .you’re in luck! Think of the CSET Science as a set of problems that YOU can solve—with a little help from a great CSET Science practice test or study guide! If you’re facing the CSET Science, you know you’re facing a high-stakes test. It’s enough to make anyone nervous. You need to know what’s on the test. So solve the problem! Problem: The CSET Science tests so much information! Where do I begin? Solution: The basic info for the CSET Science is on the official website’s Preparation Materials page, http://www.ctcexams.nesinc.com/TestView.aspx?f=HTML_FRAG/CA_CSET217_PrepMaterials.html. *The cost to take both tests at one time is $267 = no cost benefit! You’re off to a great start, but you’ll need to get more familiar with the test specifics before you begin your search for the perfect CSET test practice or preparation book. How? Read on! Face it. It’s easy to worry if your last class was years ago. But even students who just graduated may have struggled with some areas of science. Everyone needs to have some idea of what official questions will be asked on the CSET Science. Problem: I need to know exactly the type of questions on the CSET Science. Solution: Seek help from a CSET Science Practice Test and/or study guide! Review the Standards for the test on the ctcexams site. 9 pages for Subtest I. 4-5 pages each for the subjects on Subtest II. Mark the Standards you KNOW will be difficult. Find a CSET Science study guide and practice test to help you master those standards. Find study guides and tests that focus on YOUR difficult areas. Make sure there are at least 2 CSET Science practice tests. Read sample explanations of answers; make sure YOU can understand them! High-stakes tests can make anyone nervous. If you’ve always been bad at taking tests, the CSET Science can be a nightmare. How can you change that? Problem: I’m bad at taking tests. Solution: Now is the time to learn CSET Science test-taking tips. You KNOW that saying, “I’m bad at taking tests” won’t help. What, specifically, are you “bad at”? If you don’t know what makes you a bad test-taker, check these common reasons for your belief. I freeze & can’t think when I take tests! Take the virtual tour of the test site online. Then, set up your own replica of the test site. Use it to take CSET Science practice exams. Practice un-freezing! 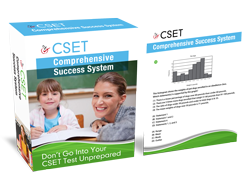 Take the free practice test on the CSET site. Look at YOUR errors. Go to the Standards on the “Test Structure” site. Use a CSET Science test study guide to focus on those areas! Focus on the times you DID pass difficult tests. Stop focusing on the fear and DO something: get familiar with standards, test questions and difficult content! I never have enough time to take any test! Purchase CSET Science practice questions that use the same framework as the real test. Then take the tests (more than 1X!) using a timer! Practice! Take CSET Science practice tests to learn which questions will take “too long”. Answer the easy questions first! You only need to PASS, not achieve 100%! Access and KNOW how to use the online calculator and the scanner now; Apply for extra time on your test using “Alternative Test Arrangements”. All the answers seem correct to me! Here’s where the best CSET Science prep guides or practice tests help: find one that gives test-taking tips that are specific to the CSET! Analyze your specific problems with answers: take CSET Science practice questions. Look for patterns in your wrong answers. Which words/phrases fool you? Watch for them! Analyze your specific problems with questions: take practice tests. Look for patterns. Learn which words and phrases fool you! I’m just not good at taking tests! Lucky you! You’ll have something in common with 50% of your future students! Learn how to help them. . . Think of every test success you’ve ever had. Go back to grade school if you need to! You ARE a test-taker! Change your attitude by using CSET study books AND sample exams until you will be good at THIS test! Take at least three CSET Science practice tests so you know the types of Q/A and know your strengths and weaknesses. Choose to take the 2 Subtests at different times. The cost is the same. It’ll help you focus on one test at a time. Take time to learn about the online calculator and the scanner (used to scan notes and drawings you may make for answers). Make it easy on yourself! Don’t wait until the day of the test! Choose CSET Science Subtest II based on your passion, even if your test seems more difficult than others! This will be YOUR area of concentration, so you could be teaching it for a LONG time! Be happy with your choice! Problem: I’ve never been good at essay questions. Solution: Analyze what is expected of a good CSET Science Constructed-Response answer! be legible (you may type in the test box or write your answer and scan it). answer the question that is asked. How can you become “good” at constructed-response questions? Practice! I don’t know where to begin studying for this part of the test! Complete the first free C-R on the general science test. Take your time. Do your best. Don’t PEEK at the ideal answer! Compare your 1st answer with the ideal answer. If you can’t do it, get help from a friend. What’s missing from your answer? Check the rubric on the Test Guide. What’s your score—be honest! Repeat! It’s time to get CSET test help: a good CSET Science exam study guide or practice test questions should include the actual rubric seen on the CSET site. It should also give you examples of C-R questions AND answers so you can keep practicing! I get confused about the question and start rambling. Find the KEY words in the question. Write them on the notepad provided. Make a plan of at least 3 points you need to make. Stick to the plan! Repeat the question’s KEY words in the first sentence of your answer. Keep going back to that sentence to keep yourself on track! Help yourself by finding the best CSET Science practice tests that teach you how to find the key words and write the best C-R answers! I forget to include basic info because I figure that everybody knows it! Your audience for the test is other educators. That doesn’t mean they’ll fill in what you forget to add. Think of yourself as that educator. Think of your answer as a student’s answer. Ask, “Is there a key part missing?” Practice going back to the question and rereading it. If there are 3 parts, make sure your answer has 3 parts. Don’t forget: you are proving that you know this info! And this answer is the only way to prove it! Here’s where good CSET Science practice exam questions with rubrics will help you see the key parts your answer is missing. It should also give you the chance to learn from more than one C-R question and answer. If you remember to answer all parts of the CSET Science question, use key words, and support your answer, you’ll do well. And the bonus is this: once you learn ways to overcome your test-taking problems, you can pass them on to your students!